More than 10 Su-35 for the UAE. An explanation in regards to the confusion over 4 or 6 Su-35S's arriving in Besovet. Also an update on Su-35 deployment. franco wrote: An explanation in regards to the confusion over 4 or 6 Su-35S's arriving in Besovet. Also an update on Su-35 deployment. Υes 6 arrived, but 4 are new built (as expected). Now all 10 Su-35s of 2017 have been delivered. Cheers!! 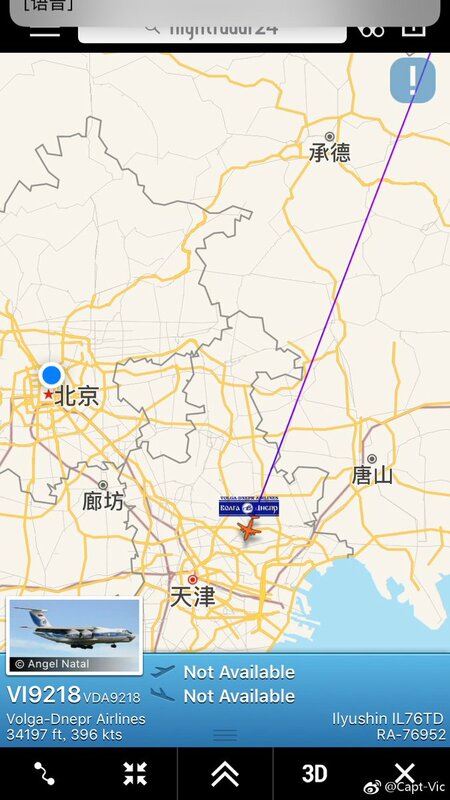 5 Su-35s led by Il-76 are en route to Zhanjiang, China. The total number is 14 now. Idk if it is true but they seem to really want the su-35. But would russia do that to India ? They didn't mind to buy rafales, why Russia couldn't sell su-35 to Pakistan then specially that China already have them. You both are so right, but that would be to easy for the Indians. They want to moan about the procurement process and how the evil Russians try to cheat them and so on. 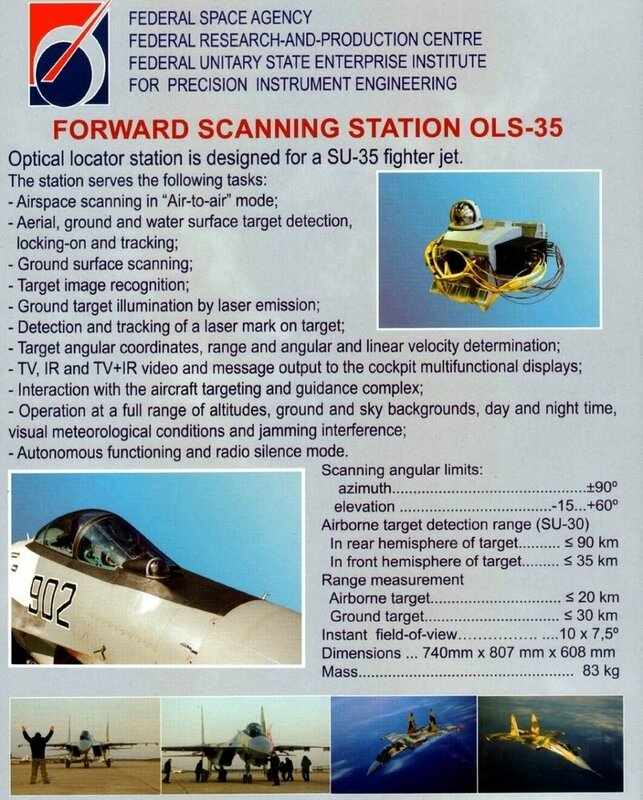 Complete description of Su-35. Description of the radar, the cockpit, design ... really nice to read. Recall that in the exposition of the MAKS-2017 airshow in Zhukovsky in July 2017, the Su-35S combat fighter (registration number "24 red", registration number RF-95816) was demonstrated in the static exposition, which was equipped with a targeting container T220. The process of re-equipping the 159th Guards Fighter Aviation Regiment of the 105th Mixed Aviation Division of the 6th Leningrad Red Banner Air Force and Air Defense Forces of the Western Military District, stationed at Besovets airfield in Karelia, is being completed for the Su-35S fighters. 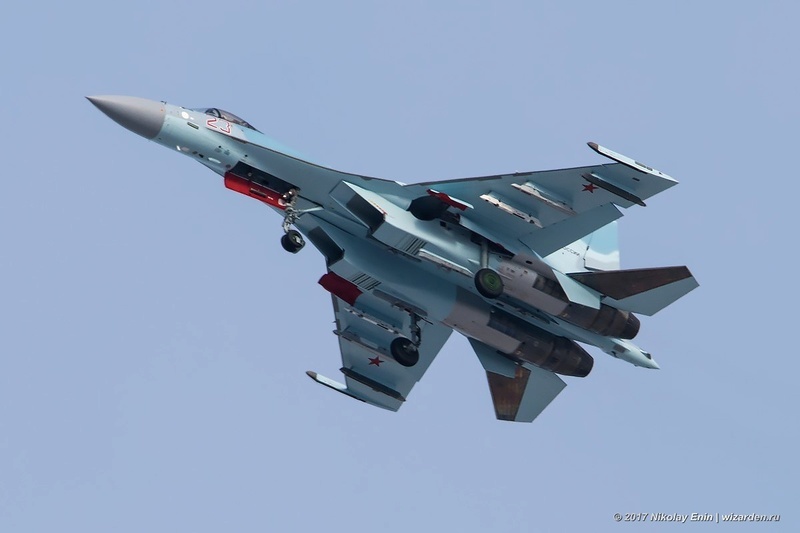 As the spoters reported , on July 13, 2018, a flight from Komsomolsk-on-Amur with interim landings in Novosibirsk and, apparently, in Perm, five Su-35S fighters sent to the 159th Guards Fighter Aviation Regiment to Besovets took place. Three of these fighters, having red board numbers "70", "71" and "72", are the first three Su-35S cars built by the Komsomolsk-on-Amur aviation plant (KnAAZ, a branch of Sukhoi Company) under the program state defense order of 2018. 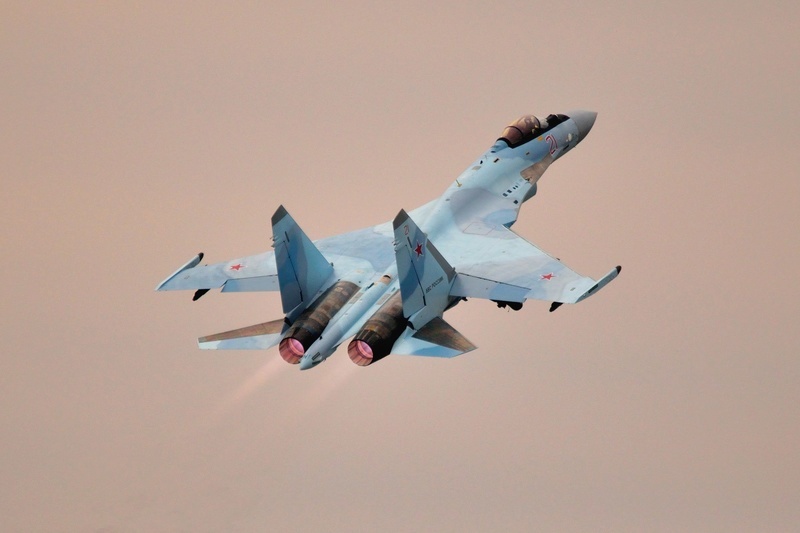 These planes were manufactured in accordance with the new five-year contract for the delivery of 50 Su-35S fighters concluded by the Russian Defense Ministry with the company Sukhoi in December 2015. The first ten Su-35S aircraft under this contract were built by KnAAZ in 2016, another ten in 2017. It was reported that according to the programs the State Defense Order of 2018, KnAAZ must hand in another ten Su-35S. 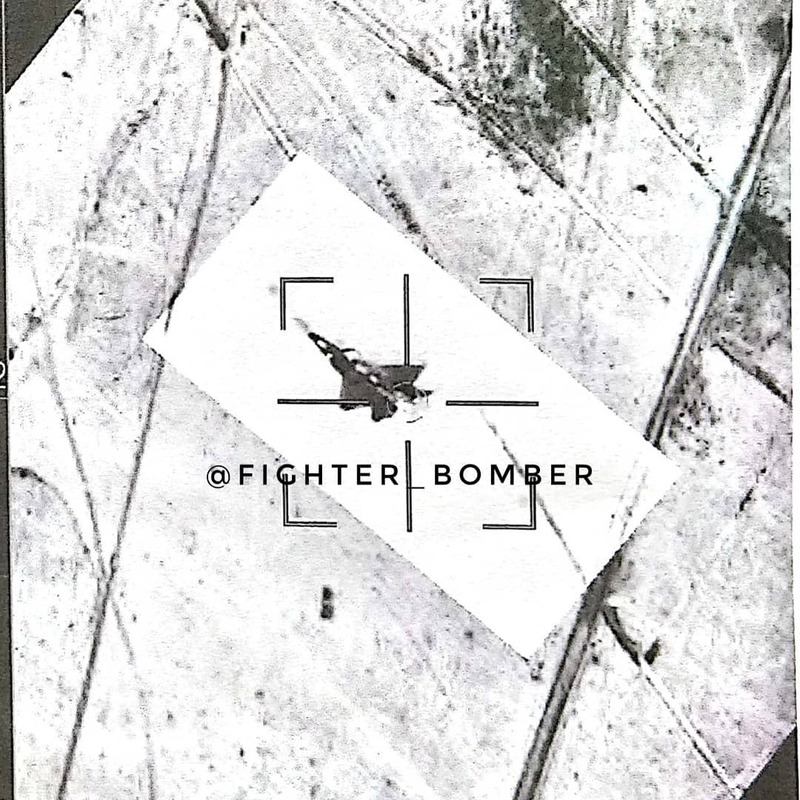 Two other Su-35S aircraft flying to Besovets on July 13 were fighter jets with red airborne numbers "07" and "10" and dark coloring are machines built by KnAAZ in 2014 and were previously part of the 23rd Fighter Aviation Regiment of the 303rd Guards a mixed aviation division of the 11th Army Air Force and Air Defense of the Eastern Military District, stationed at Dzemgi aerodrome in Komsomolsk-on-Amur. The 159th Guards Fighter Aviation Regiment began receiving Su-35S fighters in December 2016, when it included the first six fighters of this type of new construction KnAAZ with red airborne numbers from "54" to "59". During the course of 2017, the regiment received another ten Su-35S fighters built by KnAAZ under the 2017 program - six at the end of October (planes with red on-board numbers "61", "62", "63", "64", "67" and "68"), and four at the end of November 2017 (airplanes with red on-board numbers "21", "22", "23" and "24"). 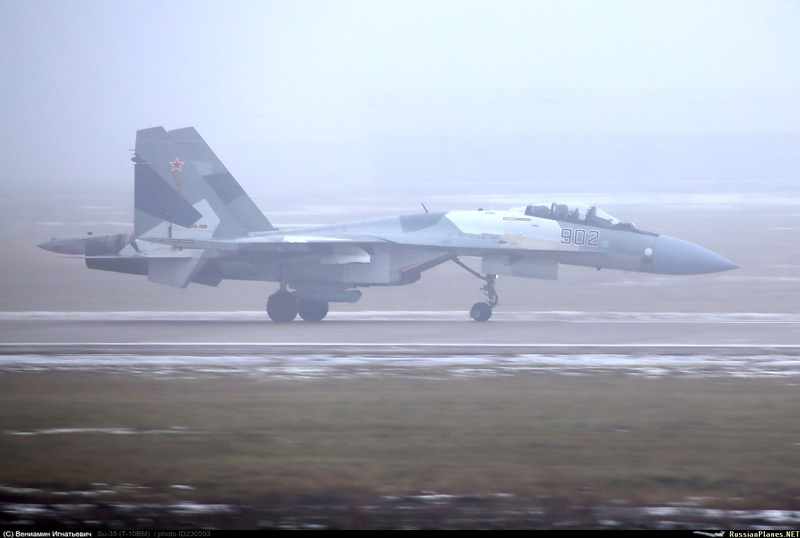 In addition, at the end of November 2017, two Su-35S aircraft from the 23rd Fighter Aviation Regiment from the Dzemgi airfield arrived in Besovets - fighters with red airborne numbers "03" and "05" and dark colors, which are machines built by KnAAZ in 2014 . 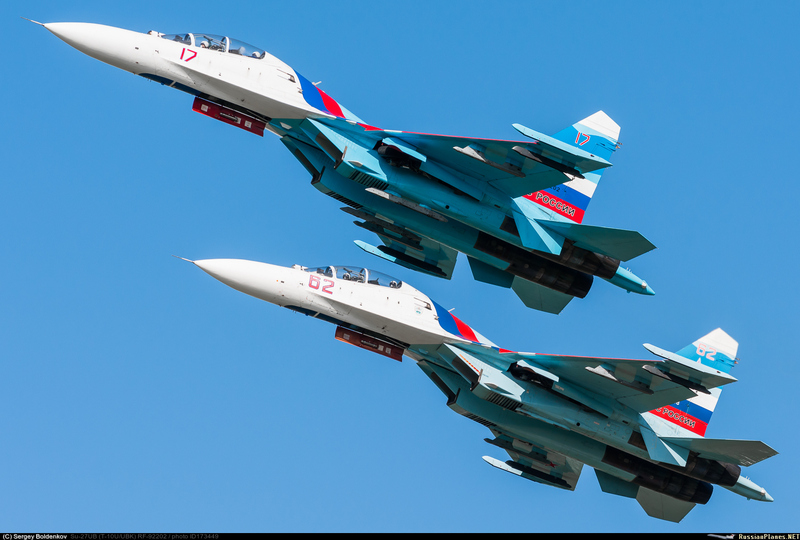 Thus, with the arrival of five more Su-35S fighters now to Besovets, the composition of the 159th Guards Fighter Aviation Regiment was brought to 23 aircraft of this type (19 new buildings KnAAZ 2016-2018 and four buildings built in 2014 from the 23rd regiment) . The 159th Guards Fighter Aviation Regiment became the first "linear" aeronautical part of the VCS in the West of Russia, which received Su-35S aircraft. Until early 2016, this regiment was equipped with unmodified Su-27 and Su-27UB fighters (two squadrons - a total of about 20 Su-27 and four Su-27UB). 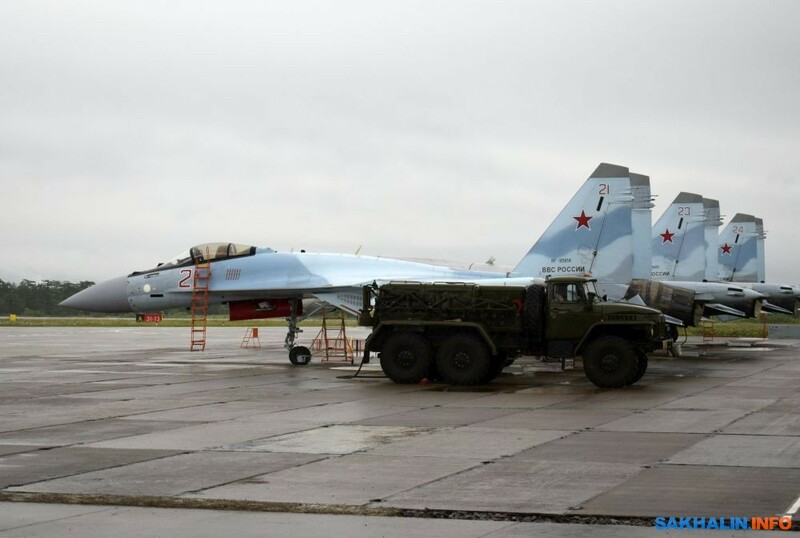 In the spring of 2016, the 159th regiment launched the transfer of modernized Su-27SM fighters that were freed as a result of re-equipping the Su-35S fighters of the Far Eastern 22nd and 23rd fighter regiments of the 303rd Guards mixed aviation division of the 11th Red Banner Army Air Force and Air Defense of the Eastern Military District. And at the end of 2016, the delivery of Su-35S fighters for the new construction was also started in Besovets. The fighter Su-27 and Su-27SM, now free from the 159th regiment, will probably be transferred to other aviation units. 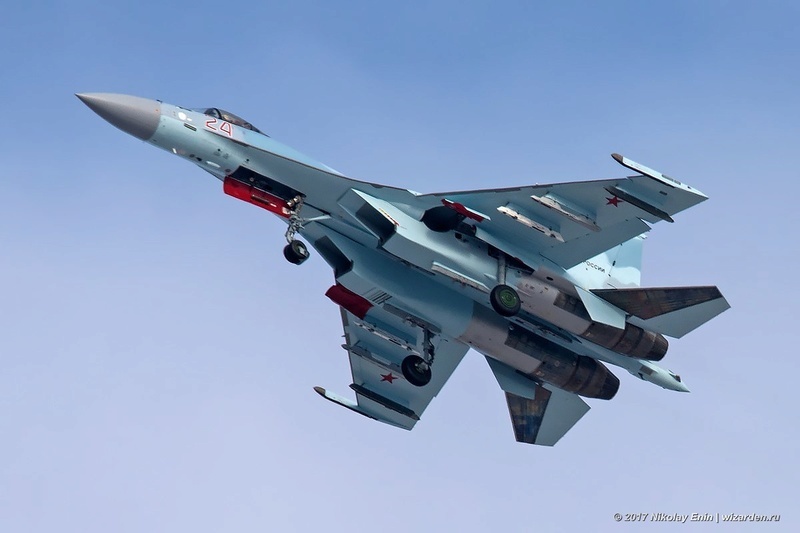 Taking into account the first contract of 2009 for 48 Su-35S fighters, the Russian military aerospace defense received in this way from the end of 2012 to date 71 serial Su-35S aircraft. MOSCOW, August 1. / TASS /. Indonesia expects to supply by October the first Russian Su-35 fighter. This was on Wednesday the ambassador of the country in the Russian Federation Vahid Supadiyadi. "We expect to deliver the first of the 11 Su-35 airplanes by October this year," he said. "In October, we celebrate the Armed Forces Day and would like to schedule the delivery of the aircraft by this date." Indonesia and Russia have signed a contract for 11 Sukhoi Su-35S multirole fighters. According to Indonesian Defense Ministry spokesman Totok Sugiharto, the $1.14 billion contract has been finalized. "Two units of Sukhoi jets will be delivered in August 2018," he added, noting that six more would be delivered 18 months after the contract becomes effective, and the remaining three would be delivered five months after that. The contract brings to an end a long-running procurement for an "F-5 replacement," which drew competition from a number of Western types such as the Eurofighter Typhoon, Lockheed Martin F-16, and Saab Gripen. Then in 2018 : Russia 10 , China 10 , Indonesia 2 …. 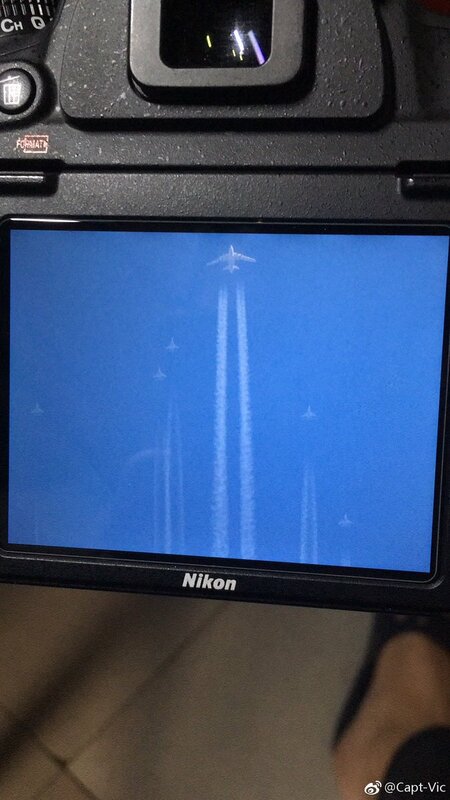 production 22 Su-35 ??? or well delay 2 of the chinese Su-35 to the first quarter of 2019 ? Anyway, in 2019 and 2020 the production of Su-35 Will be 40 or more airplanes and only Rusia (20) and Indonesia (11) have contracts. As reported on August 3, 2018 Sakhalin web resource Sakhalin.info (Sakhalin.Info), on the island of Iturup of the Kuril Islands at the airport Yasny for experimental combat duty, crews of multi-purpose fighters Su-35S VKS Russia. Vadim Rokotov, the head of the administration of the Kuril region, and the deputy commander of the 11th Air Force and Air Defense Army, the chief of aviation Oleg Solovyov, congratulate pilots, technicians and ground service engineers on the significant event of the arrival of the interim director of the airport, Yasny Mikhail Mitrofanov. - A huge number of people made an effort to our airport could take defenders of the sky. The start of duty is another reason to feel the power of Russian weapons. Let your service be easy and cloudless, but in life luck always accompanies. To the sound of the rain, Vadim Rokotov continued his congratulations. - They say that rain is a good sign for any endeavor. Let's hope that this will be fully implemented in respect of our pilots, - said the head of the administration. - On Iturup, representatives of different services are serving, now they were joined by fighter pilots. I congratulate you on joining this big family. Vadim Rokotov assured that the district authorities for their part will do everything to "life was comfortable and interesting for those who live here and will come to defend the Fatherland." In turn, Colonel Oleg Solovyov expressed gratitude to the government of the Sakhalin region, the Kuril authorities, airport employees for their assistance and support in preparing for the deployment of the unit. Experienced-combat duty is the first step to the main (permanent) duty to protect boundaries. In the next two months (before the first of October), pilots and engineering technicians, airport ground staff, need to bring the algorithms of joint action to automatism. The flight crew read out the order of the command, then, to the sound of the march, the defenders of the sky marched through the ranks and, within an hour, began working out taxiing out on the strip. Recall that the commissioned in September 2014, the airport "Clear" was originally civil. The air facility, jointly with the Ministry of Defense, became home in early 2018. The bmpd comment. Judging by the published photo, pilot-combat duty at the Yasnyi airport on Iturup is, according to rotation, a link of the Su-35S fighter from the 23rd Fighter Regiment of the 303rd Guards Mixed Air Division of the 11th Air Force and Air Defense Army of the Eastern Military District at Dzemgi airfield in Komsomolsk-on-Amur. 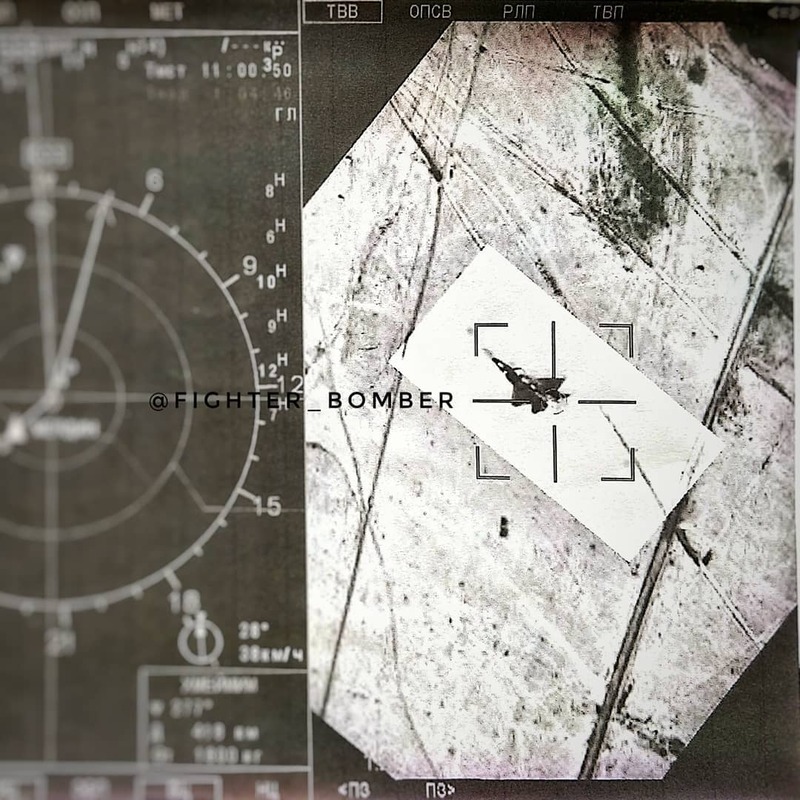 The captured Su-35S fighters with the red onboard numbers "21", "23" and "24" appear to be the 2015 planes of construction (the original red board numbers from "04" to "06"), which in 2016 were part of the the composition of the Russian aviation group in Syria. According to this article the Su-35S seems to have arrived with the Aerobatic units. 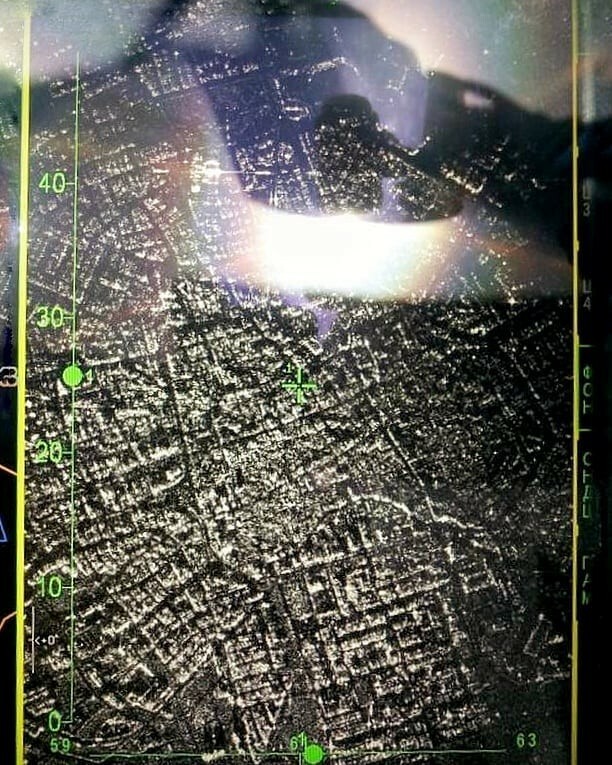 Picture of Idlib town made by Irbis radar from Su-35. Resolution is 1 square meter. Is this really a F-22, if so what angle was the Su-35 to it? USAF F-22 'Raptor' as captured trough electro-optical system OLS + TP of Su-35S of Russian Air Force over Syria. Could be a f-15 too. What is the white thing around the plane ? It looks like a bad photoshop. Do you have more pictures ? Isos wrote: Could be a f-15 too. The white IS bad photoshop, because it is a "sanitized" picture. What info they are trying to hide is quite interesting. Which leads me to believe it prolly is an F-22. That's not an F-22 the wings on those have no points they are flat, this thing does and the body shape is wrong.